Yes, it’s true. You don’t really sink all the way down in quicksand—that’s because the density of the stuff is greater than the density of water. Essentially, you float. Here is a nice video on quicksand. I. Love. This. So, MacGyver is there trying to score a nice shot in pool (the game, not the pool). He starts thinking about all the physics to get the perfect shot—one with some curve. Here is what goes through his mind. That’s pretty awesome, right? Let’s go over some of the key equations. First, why does the ball turn? If you want to turn, you have to have a sideways force. In this case, the sideways force is a frictional force on the ball as it spins and slides on the table. Once you know the frictional force, you can use this to find the new vector velocity after some short time. This is basically the numerical version of the definition of acceleration. Here’s that equation. Oh, vectors. Look at the vector notation. Winning. Where L is the angular momentum vector. For a rigid object, the angular momentum is the product of the moment of inertia and the angular velocity (for most cases). Where I is the moment of inertia (or as I like to call it, the rotational mass) for a sphere. That’s pretty much all the equations you see. Of course the amazing part is that humans can make these very complicated shots WITHOUT doing the calculations. I don’t know how that works. Two broken pieces of a pool stick and a towel. Boom. 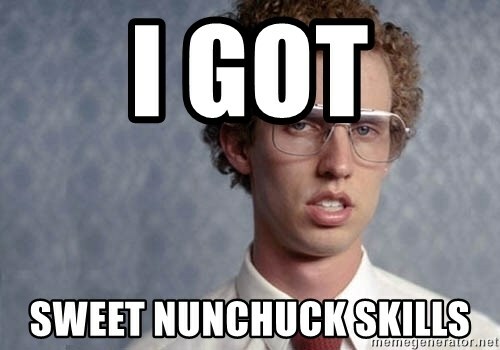 Nunchuck. But this is all I can think of. How do you track a fleeing truck? You stick your smart phone on the bottom using a magnet. Oh, this works so well that Spider-Man used this same trick the following year in Spider-Man: Homecoming when he left his phone in the Vulture’s car. There is a small problem with those car magnets. They are like refrigerator magnets in that they have weird magnetic domains. Actually, you should try this experiment. Flip it around and put it on the fridge. The magnetic domains in these flat magnets are such that they stick on one side but not the other. That makes it tough to use for a magnetic phone tracker. A better method would be to run a wire (or zip tie) through the magnet and around the phone. Like this. Yes, if you poke a hole in a can of pepper spray it will get pepper spray all over the place. MacGyver uses a broken circuit board to cut through zip ties. Zip ties aren’t that strong anyway—it seems very plausible that you could sharpen a circuit board to cut through one of these things. Is it possible to control a car with a computer? Sadly, this is real. MacGyver sprays 155 proof moonshine and threatens to light it. Yes, 155 proof can catch on fire.